*This is the second part of a series. Please read the first post here . I will not aspire to nor accept, I repeat, I will aspire to nor accept the post of President of the Council of State and Commander in Chief (…) I'm not saying goodbye. My only wish is to fight as a soldier of ideas. I will continue to write under the title Reflections by the comrade Fidel. Since early 2006, rumors began to circulate about the health of Fidel Castro, but a cable dated April 2006  contradicted these assumptions with the statements of a group of Russian officials who had met with the former president and described him as “lucid and in good health. 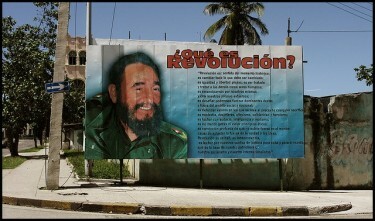 Fidel’s health began to falter and this determined his subsequent resignation. The health of the president led to the creation in March 2007 of a detailed report by Michael E. Parmly, then head of the US Interests Section in Havana. In it, it was predicted a “gradual deterioration of physical and mental health of Castro that would end with his death” and pointed to this moment as the trigger for “substantial change” in the Island. Two years later, in January 2009, Jonathan D. Farrar, sent a message  with “speculation about Fidel's health” in which he announced the death of the president based on his public absence and the lack of his usual reflections, but he also said he did not expect “violent protests nor a migratory wave” to be unleashed on the Island. Parallel to the debate on Fidel’s health the focus was also on on the governmental administration of the current president, Army General Raúl Castro Ruz. A wire revealed by Wikileaks  on January 18, dated in Havana in July 2008, summarizes a meeting that the Cuban President had with the Minister of Foreign Affairs of Brazil, Celso Amorim, held between May 30 and 31 of the same year. The elimination of the white card is a long standing claim of Cuban citizens. According to a university professor who preferred to remain anonymous, one of the topics most discussed during the referendum held at the request of Raúl Castro four years ago was the repeal of this permit. The political scientist Armando Chaguaseda explains that the white card “is not only indefensible, but it also violates the rights of the people.” There seems to be an ample consensus on the implications of the withe card within Cuban intellectuals and artists, some of whom are members of the Unión de Escritores y Artistas de Cuba (UNEAC) , and within prominent representatives of national culture, such as the singer songwriter Pablo Milanés . Facebook groups have also been created with the objective of spreading the message in favor of the elimination of the white card and many of its members are currently residing in the Island. However, the end of the exit permit will remain an unpaid debt. In the guidelines of the economic and social policy for the VI Congress of the Communist Party of Cuba (PCC) this topic is not listed in any of its twelve chapters and the cable revealed by Wikileaks seems to confirm the government's refusal to address this claim in the foreseeable future. *Photo taken by consumerfriendly  and published under License CC NC-SA 2.0 .